Produced in the Halo Studio of Portland Maine, Ben Dunham and Dave Gutter come together to create a raw and gritty duo on this exclusive track. Recorded at The Halo Studio in Portland, Maine, “Talkin’ Down” was written by Dunham with vocal collaboration from Dave Gutter, the frontman of Rustic Overtones, a psychedelic rock band out of Portland, Maine. 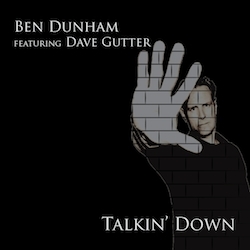 Dunham’s partnership with Gutter began after he received a stylistic comparison to the artist during the promotion of his latest album, The Backline Collective, which was released in July of 2017. Beyond partnering with 13 artists on his first album, Dunham has worked and toured with an impressive roster of musicians, such as the hip-hop funk band Dysfunkshun, Madou Dembele, and now Dave Gutter. He hopes to keep the collaborations coming in his second album, a continuation of the Backline Collective, which will be released later in 2018. About: Ben Dunham started his music career as a teenager, playing in bars and local hotspots. Anchored by a love for the bass, Ben enjoys composing music and lyrics and has contributed to many bands throughout his career. He continues to play in several bands throughout the Green Mountains of Vermont and beyond, and knows no bounds when it comes to genre.